This is the El Paso Star, in El Paso, Texas. This star took the record for largest man-made star from the Roanoke Star in Roanoke, Virginia, which I visit every so often. Looking at the El Paso Star, it just doesn’t impress me like the Roanoke Star does. 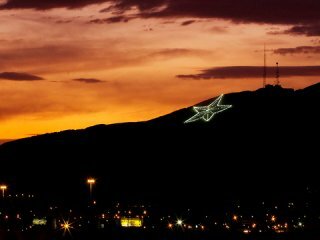 I think it’s because unlike the Roanoke Star, which is upright, the El Paso Star is lying down on the mountainside. I will admit, it’s a nice looking star, but it looks like someone shot it out of the sky and it’s lying on the ground. True, my photo of the Roanoke Star was taken at close range while the El Paso Star was taken from a distance, but still, I like my Roanoke Star a bit better because it’s upright. Web site: A favorite Roanoke Star photo set of mine, "Lights in the Foggy Night". Quote: "So that's the El Paso Star..."